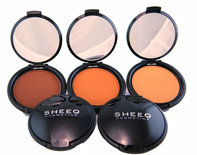 Sheeq Cosmetics • BLACK American MADE - BAM! SHEEQ Cosmetics is a Luxury Makeup and Skincare brand for the Discerning Woman, founded by Beauty Expert, Melissa R. Hibbert. SHEEQ which stands for “She’s Exquisite” was created to celebrate and honor the Beauty that exists among Women in every shade. The collection is perfectly curated with the highest quality products, best colors and shades to compliment the tone of Women who enjoy luxury. Our Skincare line is truly amazing, made with botanicals – it’s healthy, uncomplicated and extremely effective for healthy skin. The SHEEQ woman is Bold, Beautiful, Strong and Exquisite.